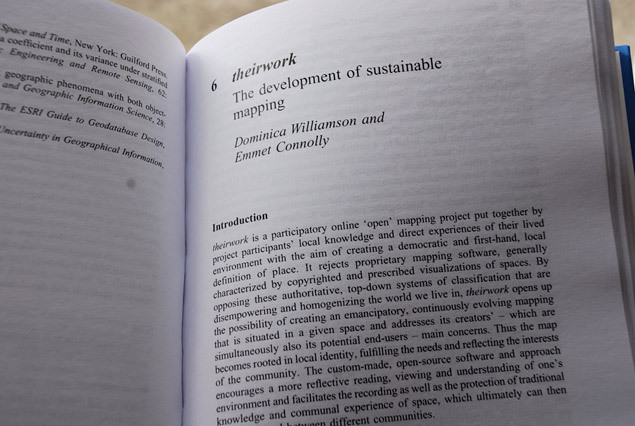 A while back my good friend and part-time partner-in-crime Dom and I co-wrote a couple of essays about an eco-walking-mapping project that we put together (previously mentioned here). Seemingly out of nowhere those words were made form and plopped through my letterbox in the last couple of weeks. So I’m in print! This is the first time anything I’ve written has been published, and I must say it feels quite proper. There’s definitely something about the 140 character revolution that devalues the ongoing notion that I have of publishing; the web is fast, which these two-year old pieces in new books are most certainly not, but it’s also so very transient. These printed things, on the other hand, might be sitting around somewhere, mildewing on a shelf for the next hundred years (for better or for worse). They’re both valid formats, but I can’t help thinking there’s also room for a more agile, disposable book-like thing somewhere between these two extremes. I’m not a writer, but finding the right tone for each publication was an interesting process. 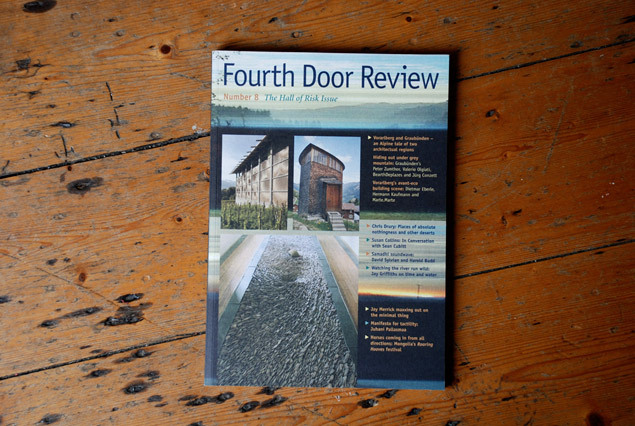 Rethinking Maps and Fourth Door Review both quite academic in style, but fundamentally one is a magazine and the other is a book, and I learned a bit about their respective editorial requirements based on the feedback we got on our first drafts. Again, the odd strength and weakness of writing online might be it’s lack of any kind of editorial requirements, so you get philosophical musings sitting next to (or rather, above) holiday photos. In the long run I think that the freeform style of the web gives rise to more creative freedom, or at least lack of restriction and self-consciousness, and ultimately the potential for greater things. At least for the writer, if not the poor soul who has to slog through it all (cf. this paragraph). I’m pretty delighted to be involved with both publications. 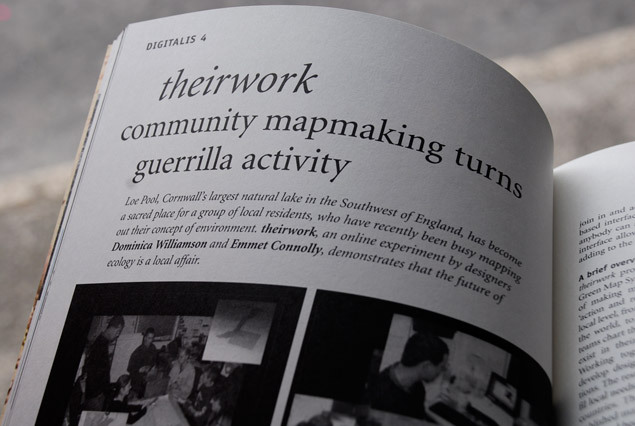 The magazine is a handsome affair: large, printed on good quality paper, colour photos throughout, and a broad canvas: Swiss architecture, neogeography, wilderness, land art, digital projects, crafts, music. 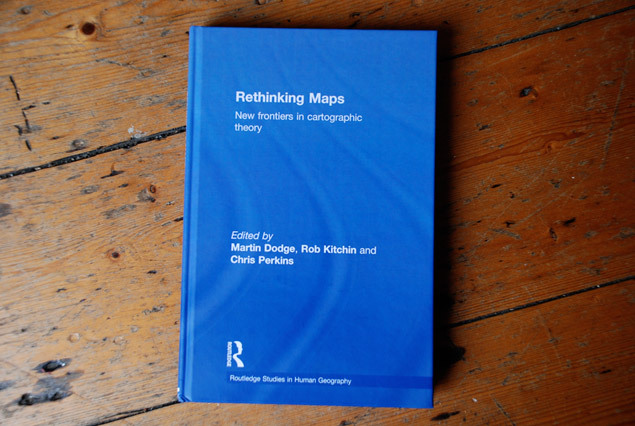 The individual chapters of the book are just as diverse, taking maps as a jumping-off point into a range of disciplines (chapters on The emotional life of maps and The 39 Steps and the mental map of classical cinema sound pretty good to me). Neither of the pieces are available online, but I guess that’s the nature of the beast. I wonder if Twitter’s change from having numbered, paginated archives to having an AJAX-ey “load more” link at the bottom is somehow intended to reinforce this idea of impermanence; the transition from pages (which suggest archived content) to streams (where the past simply recedes to a vanishing point).